Hyperpolitics is an online platform for the hypertextual framing and navigation of political science concepts. It has been developed by an international research team directed by Mauro Calise and Theodore J. Lowi, and published as a book by University of Chicago Press. Hyperpolitics allows for rapid access, through hypertextual links, to a wide range of full text references, thus stimulating and guiding the organization of knowledge. All definitions are constructed using the same analytical pattern, a matrix of twelve logically interrelated keywords. This results in a dynamic process of conceptual processing, combining the breadth of specialized sources with strict control of the logical steps. Construction of a definition is a stepwise process, allowing for better exposition – and discussion – of the various parts. Definitions share a common logical structure, which makes for easier comparison. As each matrix is developed using a common set of 100 keywords, Hyperpolitics grows into a systemic network of logical crossreferences: a hyperdictionary. 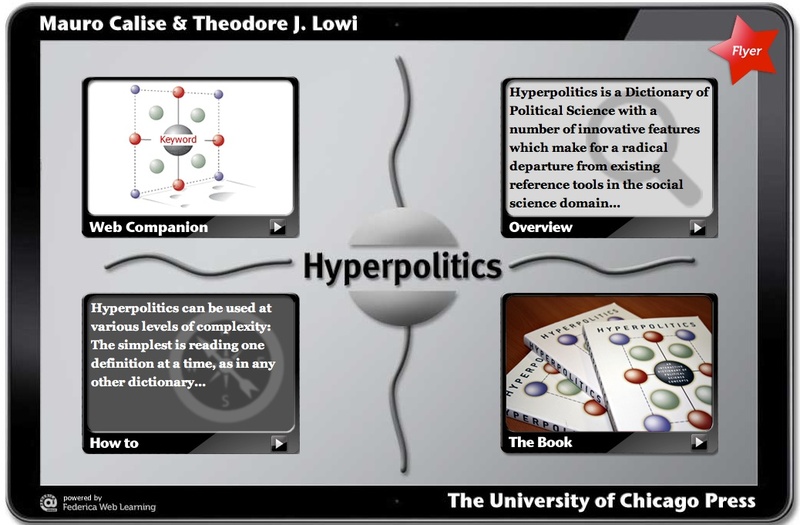 Thanks to its user-friendly interface, Hyperpolitics can be used for scholarly research as well as for teaching purposes, in both the classroom and distance education. It is an easily exportable model for other disciplines in the Social Sciences domain. Hyperpolitics is open to any user both in a «read» and «write» mode.